St. Clare parishioners are a dedicated and enterprising group of people that step up to help those in need. Events such as Reachout Night and the preparation of the monthly meal for Love, Inc. are just two ways in which volunteers help out needy families in the community and beyond. Donations are received monthly for the food pantry in Burlington and parishioners donate and prepare a meal once a month for Love, Inc. During Reachout Night, volunteers prepare a meal, make blankets, and decorate cookies along with preparing other items to donate to the Repairer's of the Breach homeless Shelter in Milwaukee. The following day volunteers take the meal and items to the shelter where they serve the meal and spend time with the people that reside in the shelter. 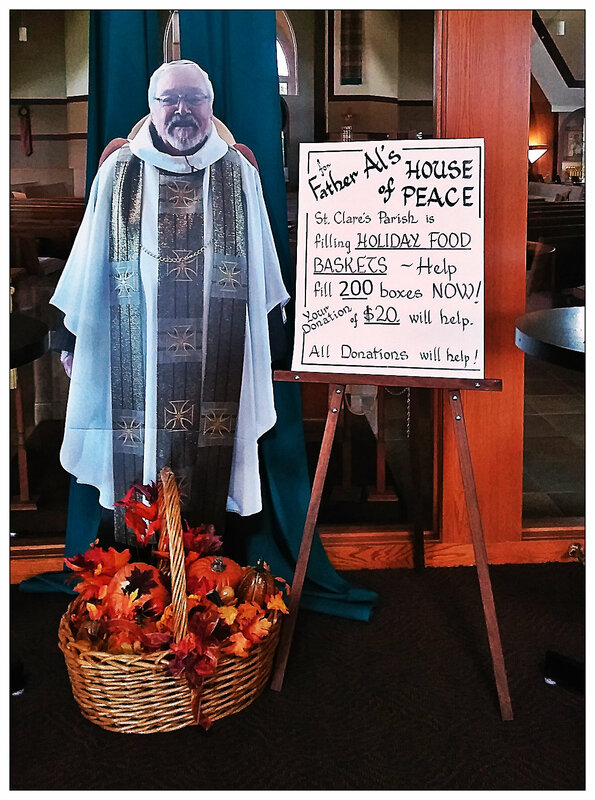 In the fall we collect money for the Food Drive to benefit the House of Peace in Milwaukee. These much needed donations go to purchasing food for food baskets for the needy for the holidays. We are grateful we have such kind and caring members at St. Clare. There are numerous other ways to help throughout the year. Watch the bulletin and listen to the pulpit announcements for other opportunities to help!